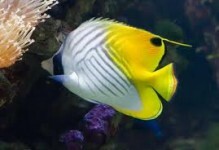 The Mertensii Butterflyfish, also known as the Orangetail Butterflyfish, or Crowned Pearlyscale Butterflyfish, is a blue silver coloration with black margins on its body scales. 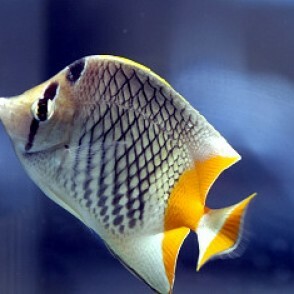 This gives a criss-cross pattern and pearly sheen. 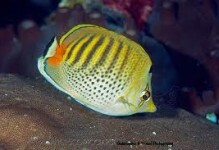 Most of its posterior is orange and it has a silver-edged black stripe through the eye. 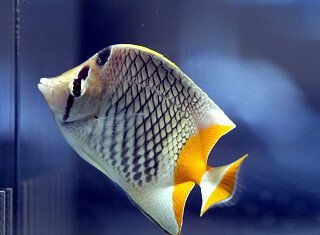 It may reside in a 120 gallon or larger aquarium provided that it is well-maintained and relatively peaceful. 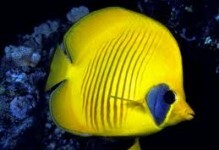 It may be kept with other Butterflyfish if they are introduced to the tank at the same time. 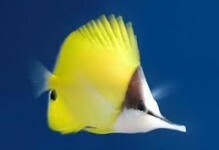 The diet of the Mertensii Butterflyfish should include various meaty preparations.